It’d be an understatement to say that José Andrés is a powerhouse here in the Washington, DC area. He practically owns half of DC’s Chinatown neighborhood with Jaleo, Oyamel, Zaytinya, and minibar and he’s quickly expanding to other parts of the region with Jaleo in Arlington, VA. In the new year, Lauren and I are looking to eat a little healthier and to incorporate more vegetables into our diet. It’s actually surprisingly hard to find that in a restaurant. It’s hard to find something that doesn’t incorporate sugar, cooked in butter, or smothered in cheese. After exploring some menus, we decided upon going out to Oyamel last night. They do an incredible job of featuring lots of vegetables and lean meats. Oyamel showcases José Andrés’ take on various Mexican regional cuisines served in a whimsical fine dining atmosphere served on small plates meant to share. This is definitely not your neighborhood Chipotle. It takes your idea of what’s possible for Mexican food to an entirely new level. Of course, when you sit down, you’re given the requisite chips & salsa. Because the seasoning, the chips are incredibly addictive but don’t eat too many. You don’t wanna spoil your appetite for what’s to come on the menu. The salsa was very thick and had this incredible smoke to it. Additionally, as your appetizer, you have to try the guacamole. For $12, it’s definitely not cheap and I’m not sure that it’s that much better than what you can make at home but you have to try it. The novelty comes in that your server will come to your table and serve it to you table side. It’s slightly entertaining and adds to the enjoyment of the dish. Lauren got a ceviche. I don’t remember which she got and I didn’t take a photo. I just tried a bit of it. It was crisp & refreshing. Oyamel has its own ceviche bar where it’s fish masters dish out the evening’s delight from the sea. These were little tortillas filled with turkey confit. Had a nice spice. There was a nice textual component from the pecans on top. The thought of brussel sprouts makes most children shudder. Somewhere in my adult life I learned that brussel sprouts can be delicious. 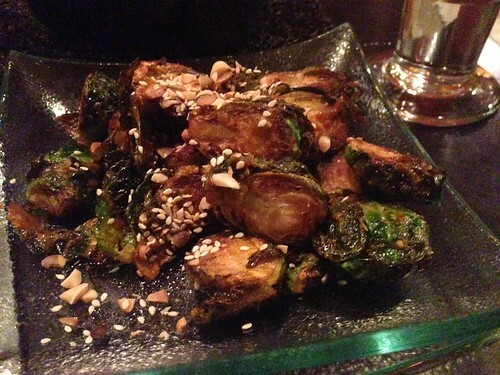 They were crispy and perfectly caramelized to bring out the sweetness in the sprouts. They tasted like vegetable candy. 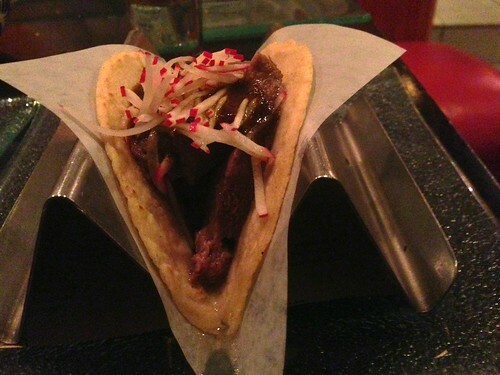 This was the taco with beef tongue. I know you’re like “beef tongue” ?!? Honestly, I don’t know if I was blind folded and fed the taco if i’d be able to tell the difference between it and any other kind of beef. It was texturely pretty similar. 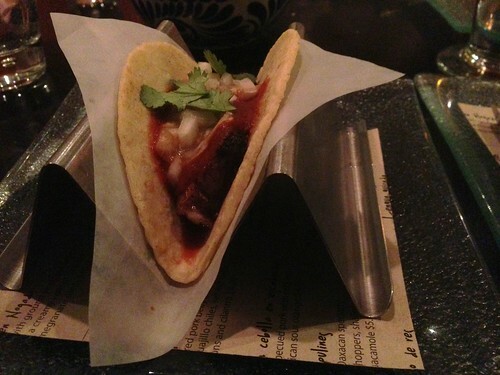 The finale was the pork belly taco. What shall we say about pork belly? It melts in your mouth. It’s one of my favorite cuts of meat on the pig. All in all, we left the night happy and full. It was a delicious meal. It continues to be one of our favorite restaurants and I’m sure we’ll go back many more times. I’d recommend everyone making a reservation. 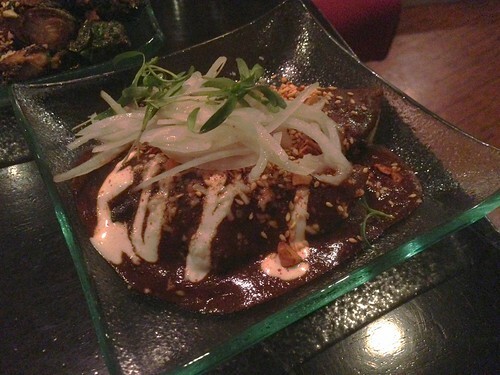 Thank you José Andrés & team for taking us on the continuing Mexican adventure.